Mary Bartlett was born in 1730 in the town of Newton, New Hampshire, one of ten children. Her father, Joseph Bartlett, had been made captive by the French and Indians in 1707, and carried to Canada and held there for four years. Mary Bartlett grew into a lady of excellent character. Josiah Bartlett was born in on November 21, 1729, to shoemaker Stephen and Hannah (Webster) Bartlett in Amesbury, Massachusetts. He was their fifth child and fourth son. He attended the common schools, but with uncommon success. By the age of sixteen, he had built a foundation in Latin and learned some Greek. In 1745, Josiah began to study medicine, working in the office of Dr. James Ordway of Amesbury, and used the libraries of Dr. Ordway and neighboring towns to supplement his medical knowledge. Bartlett gained recognition locally by successfully treating diphtheria patients with a new procedure, Peruvian bark (quinine), and by the application of cooling liquids to temper fever. He became renowned for relying on observation and experimentation in the diagnosis and treatment of his patients. In 1750, before turning twenty-one, Josiah moved ten miles north to Kingston, New Hampshire, and began his medical practice. By hard work, determination, and luck became a man of property and influence. Kingston at that time was a frontier settlement of only a few hundred families. If a man could stitch wounds, set bones, and treat fevers, he was welcome, even without formal educational credentials. As the only doctor in this part of the county, Josiah’s practice prospered, and he purchased land and added a farm to his credit. On January 15, 1754, Mary married Dr. Josiah Bartlett, her first cousin. Mary was then twenty-four years old, an amiable girl, and well educated for the time. For the next ten years, Mary’s life was that of the wife of a popular and prosperous young country doctor. They would remain a devoted couple until her death in 1789. Dr. Bartlett had a large family, and built a large home in Kingston. He was democratic, kindly, and fast growing in the esteem of his fellow citizens. Twelve children were born to Dr. and Mrs. Bartlett, of whom eight grew to maturity: Mary (1754), Lois (1756), Miriam (1758), Rhoda (1760), Hannah (who died as an infant in 1762), Levi (1763), Josiah (1765, died that same year), Josiah (1768), Ezra (1770), Sarah (1773), Hannah (1776, also died as an infant), and a child that was never registered. Three sons, Levi, Joseph, and Ezra, followed in their father’s footsteps and became eminent physicians, and all three of them took considerable interest in public affairs, and held positions of honor and responsibility. Mary Bartlett left us a priceless heritage in letters that have been carefully preserved. Unusually well educated for the times, Mary wrote regularly to Dr. Bartlett while he was attending the Continental Congress in Philadelphia in 1775 and 1776. Her letters show that she not only wanted to keep her husband informed, she also wanted to ask his advice. With Josiah gone, there was no medical help available for emergencies, and Mary expressed her worries about the children and about her own health. 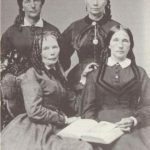 Her letters are full of accounts of the children’s ailments – Sally’s colic or worms, Ezra’s “canker and scarlet fever,” Rhoda’s fainting spells, Lois’s pain in head and sore throat. “Miriam,” she wrote on September 24th, “has been poorly,” probably because she took “a cold bath in the sea” – and added that dysentery was very prevalent. 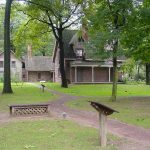 Mary also reported on her own “sick headaches,” and on September 9, 1776, begged (concerning her pregnancy), “Pray do come home before cold weather. As you know, my circumstances will be difficult in the winter – if I am alive.” But letters often took more than four months to reach their destination. Because Dr. Bartlett was the family physician to many in Kingston and surrounding villages, she often reported to him on the condition of his patients and of illnesses and deaths in the community. No doubt Mary’s letters alarmed Josiah as much as his upset her. When he complained of his frequent colds and coughs, she immediately dispatched by stagecoach a warm gown and a cordial made of rum with cinnamon, saffron, and sugar. By the time such remedies would have reached him, he must have been completely recovered. Mary supervised the work on a farm that covered many acres, and ran a large household that included several servants. The family was dependent on the produce raised on the property, and Mary was faced daily with decisions about crops, livestock, money matters, and childcare. Spinning, weaving, making clothing, preparing meals over a fireplace, and preserving foods for the winter kept Mary and her household constantly busy. Josiah replied with suggestions about saving seed corn, telling Peter to take good care of the cattle and not to waste hay, hiring a “good hand” for nine months or a year, and buying a few barrels of apples so that there would be plenty of New Hampshire cider. Mary not only kept things going at home; she showed interest in the aims of the Revolution. “I believe this year (1776) will decide the fate of America,” she wrote to Josiah. 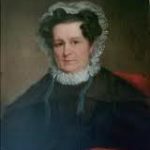 In spite of her hardships, she felt herself to be a part of the new government that was taking shape under the direction of Josiah Bartlett and other representatives of the thirteen colonies. Josiah Bartlett actively practiced medicine for 45 years; this alone was a major accomplishment. He had no university training, but he was willing to consider what worked, and avoided some traditional therapies such as bleeding. He lived during a time when medical practice was progressing rapidly. His wide reading, steady hands, and conscientious work made him an effective and successful physician. He founded and was the first president of the New Hampshire Medical Society. The area around Kingston, NH, had an epidemic of a fever and canker simply called throat distemper around 1735. For adults, it was a serious illness, but for children it was frequently fatal, especially among the very young. When the illness struck again in 1754, Dr. Bartlett simply tried doses of several available drugs, and discovered that Peruvian Bark would relieve symptoms long enough to allow recovery. His reputation was firmly secured. In 1790, son Ezra graduated from Dartmouth College, and Dr. Bartlett delivered the commencement address. He was awarded an honorary Doctor of Medicine the same day his son earned that degree. In part, the honor was due to his signing of the Declaration of Independence, and his new selection as President of New Hampshire. But, in part, it was in recognition of his medical career. Three of Dr. Bartlett’s sons and seven of his grandsons became physicians. 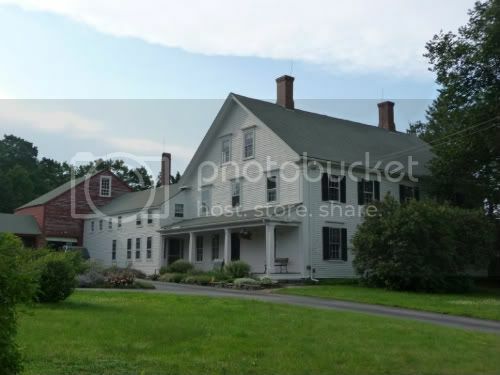 From 1774 until his death, this was the home of Mary and Josiah Bartlett, physician, Revolutionary patriot, and signer of the Declaration of Independence and the Constitution for New Hampshire. Growing in stature and reputation, Bartlett was elected town selectman in 1757. Like many prominent men in small communities, he became active in the political affairs of Kingston. Bartlett’s fellow citizens chose him to represent Kingston in the Provincial Assembly in 1765. In this position, he generally supported colonial interests, raised the Seventh Militia Regiment, and served as the liaison between the New Hampshire Provincial Assembly and Royal Governor Benning Wentworth during the Stamp Act controversy in 1765. Hoping to enlist Bartlett’s support in the royalist cause, Wentworth appointed him justice of the peace in 1767, and soon thereafter, a lieutenant commander of the Seventh Regiment. By 1774, the aggressions of the Governor, and the policy of the British Ministry which he was trying to enforce, had grown burdensome to the people. 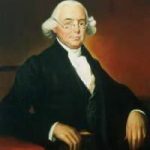 Dr. Bartlett began to work with the revolutionary leaders of the other twelve colonies, and in that year was at the head of the Committee of Correspondence, which was in constant communication with Samuel Adams and other patriots of Massachusetts and Connecticut. Soon thereafter, the Bartlett house was set on fire and burned to the ground, believed to have been set because of his patriotic activities. Dr. Bartlett declined the appointment to the Congress, moved his family out to the farmhouse, and began rebuilding their home immediately. In February 1775, Governor Wentworth dismissed him from all of his appointed offices for his open resistance to the Crown. Two months later, when hostilities broke out at Lexington and Concord, Governor Wentworth fled from New Hampshire, boarding a British warship. Bartlett was selected as a delegate to the Second Continental Congress in 1775, and attended that session as well as those in 1776. For a time, he was the only delegate attending from New Hampshire. Much of the work of the Congress was carried out in Committees. The most important of these had a delegate from each state, which meant that Bartlett served on all of them. His hard work in these committees made him one of the most influential members in the Congress. Before the Congress convened in February 1776, Bartlett wrote, “The time is now at hand when we shall see whether America has virtue enough to be free or not.” After his continued letters home to the Assembly and the Committee of Safety in New Hampshire, William Whipple and Matthew Thornton had been added to the delegation in Philadelphia. When the question of declaring independence from Great Britain was officially brought up in 1776, Bartlett was the first to be asked, and answered in the affirmative. On August 2, 1776, when the delegates signed the formal parchment copy of the Declaration of Independence, Dr. Bartlett’s position made him the second to sign, just after John Hancock, the president of the Congress. I have been for about a week on a Committee of one member from Each Colony to form a Confederation or Charter of firm and Everlasting Union of all the United Colonies. It is a matter of the greatest Consequence and requires the greatest Care in forming it. May God grant us wisdom to form a happy Constitution, as the happiness of America to all future Generations Depend on it. Although re-elected to the Continental Congress for 1777, Dr. Bartlett was unable to serve, because he was exhausted by his arduous duties in that body during the previous year, and by the difficulties of travel in following the Continental Congress, but while at home he was still busy with public affairs. He joined General Stark in Vermont in 1777 to furnish New Hampshire troops and the wounded there with medical supplies and assistance after the American victory at the Battle of Bennington. 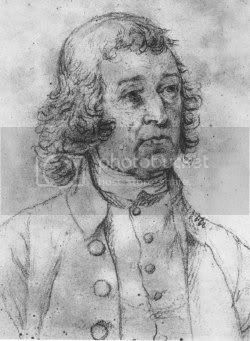 He was re-elected to Congress in 1778, and was the first to vote for and sign the completed Articles of Confederation. This was the last of his federal service, as he felt he had neglected his family for too long. Leaving Philadelphia in 1778, Bartlett began another career in New Hampshire. Although he had no legal training, he was appointed Bartlett Chief Justice of the Court of Common Pleas, and he served there from 1779 until 1790. In 1782, he was appointed Associate Justice of the New Hampshire Supreme Court, and Chief Justice in 1788. That same year he was a delegate to the New Hampshire convention for the adoption of the Constitution, serving part of the time as its Chairman. He argued forcefully for ratification, which finally took place on June 21, 1788. During all this period, Mary Bartlett had been the closest friend and counselor to her husband. Just as he had consulted her over his troubles as a young physician, helping to bear the home burdens of his patients and personal friends in their little community, so now he consulted her about the greater troubles and dangers that menaced the country. As always, she was a true partner. Mary’s patriotism was as ardent as his and burned with as steady a flame, and when their home lay in ruins and the family were driven to seek shelter and safety elsewhere, she took their numerous brood to their little farm, which she managed thereafter, leaving Josiah free to devote himself almost entirely to public affairs. Between his public duties, Dr. Bartlett found time to begin rebuilding a fine New England mansion on the site of their ruined home. While he was at the Congress, Mary oversaw the construction of the house until it was finished, managed the farm, cared for nine children, and given birth to the tenth, Hannah. for herself, left alone to bear the double duties incumbent upon her; no complaints, only a spirit of loving, helpful sympathy in all his acts. Mary Bartlett died in their new home in Kingston on July 14, 1789, and her death was a great blow to her husband, who was at the time Chief Justice. Elected to the new U.S. Senate from New Hampshire in 1789, Bartlett declined to serve, probably due to his age (sixty) and the weight of his legal duties. But in 1790, he was elected President of New Hampshire by an overwhelming majority. When the new State Constitution took effect in 1792, he continued as the first Governor. During his tenure, he oversaw the installation of a new state constitution, compilation of the laws and statutes in force, and provision for the early payment of the State’s debt. He actively promoted agriculture and manufacturing, improvement of roads, and saw the start of projects to build canals to better unite the people. I now find myself so far advanced in life that it will be expedient for me, at the close of the session, to retire from the cares and fatigues of public business to the repose of a private life, with the grateful sense of the repeated marks of trust and confidence that my fellow-citizens have reposed in me, and with my best wishes for the future peace and prosperity of the State. But he did not long survive his retirement from public life. Dr. Josiah Bartlett died at his home in Kingston on May 19, 1795, at the age of 65. He is buried next to his wife Mary in the Plains Cemetery, also at Kingston. Josiah Bartlett was described by his contemporaries as a tall man of fine figure, affable but dignified in his manner, and very particular in his dress. He wore his auburn hair in a queue, a white stock at his throat, ruffles at his wrists, short clothes, silk hose, and low shoes with silver buckles. His mode of living was unpretentious. He rose to office and was recommended by his fellow citizens, not less by the probity of his character, than the force of his genius. But standing on his own merits, he passed through a succession of offices which he sustained with uncommon honor to himself, and the duties which he discharged not only to the satisfaction of his fellow citizens, but with the highest benefit to his country.